Minion: The game's enemies, consisting of a minion figure and a minion card. There are 3 types of minions: Normal, Leader and Boss. Minion Column: A column of minion cards that is created when generating an encounter. The column determines the order in which minions will activate, starting with the minion at the top of the column and moving down the column in order. Minion Turn: A turn that consists of each minion being activated once. Defend: Roll a die stored on a character card to block 1 or more damage. Discard: Discarding a die means moving it to the discarded die pool. Discarding a card means moving it to the discard pile of the deck it came from. Encounter: An encounter is when minions are brought into play. Encourage: An action that can be taken by a player to give 1 of her stuffy's stuffing to another stuffy or to store 1 of her dice on another player's stuffy card. Equipment Slot: Each stuffy has 4 equipment slots: Head, Body, Paws, and Accessory. Each slot can have only 1 card equipped to it. Figure: The miniatures representing the players' stuffies and the minions in play. Group Task: A task that multiple stuffies can contribute attribute dice to on each of their turns. Heart: The game will grant players hearts for accomplishing different story related tasks. Players can spend hearts to use 1 of their stuffy's earned abilities. Item: A type of card that players can get by searching. Map: A page of the Storybook that figures are placed on and moved around. Party Item: An item that, once found, is put in reach of all players and is available to all players to use. Range: The number of spaces away an attack can reach. Skill Test: A test with a target number. Players will roll a specific color of dice to take a skill test. The roll result must meet or exceed the test's target number to pass that test. Sleep Deck: A deck of cards that a card is revealed from each time a stuffy collapses and each time the Storybook directs players to reveal a sleep card. If the Waking card is revealed, players no longer reveal sleep cards when directed to. The Waking ending will trigger (instead of the Asleep ending) if the stuffies win. Space: A single square of the grid laid over a map. Status Card: Effects that are attached to stuffies when the game directs. Stuffing Dice: These white dice allow a stuffy to regain stuffing during the Find Stuffing step. Stuffing dice are sometimes referred to as white dice. 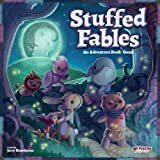 Stuffy: The stuffed animal characters the players play as. 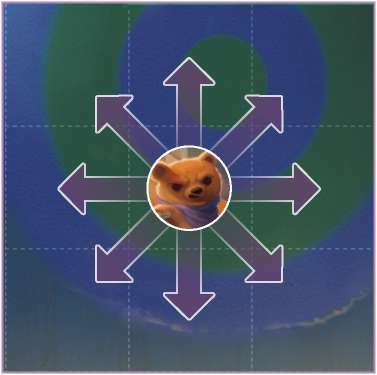 Surge: When there are no minions in play and the number of dice on the threat track is equal to or higher than the number of stuffies in play, a surge happens. Each page has its own surge effect(s). Threat Dice: These black dice represent the growing danger facing the stuffies. When minions take their turn, these are used to determine minion actions. Threat dice are sometimes referred to as black dice. Threat Track: The track on the sideboard where black threat dice are placed when drawn.